Lehigh Valley was shut out in game one before rain postponed the second. Double header scheduled again for Sunday. Reading split their double header, getting shut out in game one, then shutting out the Portland in game two. Clearwater rebounded with a win against a Braves’ pitching prospect. Lakewood’s Nick Fanti (8.2 innings, 9 K) combined with Trevor Bettencourt to no-hit the Columbia Fireflies, 1-0. Lehigh Valley (14-13) was shut out for the fourth time this season, 8-0. A second game was rained out. Double header tomorrow, probables: Appel and TBD. Ricardo Pinto went 3.0 innings and gave up 7 runs on 5 hits, 4 walks, and 2 HR. Colton Murray (4.50) struck out 4 in 2.0 innings. Wander Perez (5.63) struck out 2 in 1.0 innings. Pinto recorded a game score of eight. Jorge Alfaro and Taylor Featherston (.286) had 2 hits each. J.P. Crawford extended his hitting streak to three. He has hit in 8 of his last nine, and gone 9 for 32 (.281) in those games. Reading (14-11) split a double header, losing 5-0 on 2 hits and winning 2-0. Shane Watson (2-1, 4.84) went 3.0 innings. He allowed 5 runs (4 earned) on 7 hits and a home run. He walked none and struck out none. Tom Windle (8.31) and Alexis Rivero (2.25) pitched 3.0 shutout innings. Scott Kingery and Malquin Canelo had the only hits in game one, both doubles. Mario Sanchez (2.60) started game two and went 3.2 innings, He gave up 2 hits and walked two. He struck out three. Yacksel Rios (1-1, 2.16) struck out 2 in 1.1 innings and picked up the victory. Jesen Therrien (1.62) struck out 3 in 2.0 innings and earned his fifth save. Chace Numata (.211) and Jorge Flores had 2 hits apiece. Kingery and Kyle Martin had the only other hits. Flores had the only RBI. Kingery started the game with a triple and scored on a wild pitch. Clearwater (19-11) put five earned runs on the board early against Touki Toussant, the Braves #11 prospect (and 2014 1st round pick by Arizona), and won 7-4. Blake Quinn (1-1, 3.33) gave up 3 runs on 9 hits and a walk in 5.0 innings. He struck out 5 and gave up 2 HR. Austin Davis (1.33) pitched 3.0, one-run innings. Jeff Singer (1.98) retired all three batters in the ninth for his 6th save. The Threshers amassed 13 hits. Every starter had at least one hit. Damek Tomscha (.346), Drew Stankiewicz (.350), Zach Coppola (.293), and Grenny Cumana (.250) had 2 hits each. Herlis Rodriguez hit his 5th HR. Rodriguez and Austin Bossart had 2 RBI apiece. Bossart also drew 2 walks. Cumana stole 2 bases (7) and Coppola stole one (7). Coppola had an outfield assist. Lakewood (18-12) no-hit Columbia, 1-0. Nick Fanti (2-0, 1.48) pitched 8.2 innings, allowed 3 walks, and threw 113 pitches before being relieved. Trevor Bettencourt ended the suspense with a 4-pitch strike out to earn his second save and preserve the combined no-no. Fanti struck out nine including Tim Tebow twice. He didn’t allow a base runner until a leadoff walk in the fourth inning. That runner was erased on a steal attempt by catcher Edgar Cabral. A leadoff walk was stranded in the fifth. Fanti pitched clean through the next three innings, striking out the side in the eighth. Although he had thrown 97 pitches, Fanti came out to pitch the ninth. The first batter reached second on a throwing error, but was thrown out at third on a fielder’s choice. Fanti got the second out on his ninth strike out. After a walk and 113 pitches, Coach Malloy made the call to the pen. Blake Taylor pitched well for Columbia and the BlueClaws didn’t get on the board until the eighth inning. They scored an unearned run off a Fireflies reliever without benefit of a hit. Cabral reached second on a throwing error and was sacrificed to third by Danny Zardon. He scored on Jose Antequera’s sacrifice fly. Lakewood only managed 4 hits. Carlos Duran had two, Cabral (double) and Zardon one each. “A wiry-bodied lefty listed at 6-foot-1 and 188 pounds, Fanti flummoxed the Yankees with a mid-80s fastball that peaked at 88 as well as a sneaky curveball in the high-70s and a developing changeup with a touch of fade in the low-80s. Although the fastball wasn’t overpowering, his ability to add hard cut and run at will enabled him to get swings and misses and weak contact all afternoon. The outing only continued a run of success he’s had this year in a return to the GCL, where he’s gone 4-0, 1.38 with 47 strikeouts and just five walks in 33 innings. Fanti went on to a 7-0 GCL record, 1.57 ERA, and 0.87 WHIP with 65 K and 9 BB in 51.2 IP. He was one of two pitchers selected to the GCL end-of-season All Star Team. The other was team mate Sixto Sanchez. 2B Daniel Brito was also selected to the team. 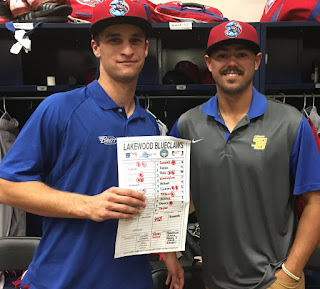 5/6 – RHP Harold Arauz assigned to Lakewood BlueClaws from Williamsport Crosscutters. 5/6 – LHP Zach Morris assigned to Phillies Ext. Spring Training from Lakewood BlueClaws. Crawford trending steadily upward. That’s huge if he can build on the recent change he made with his hands. 8 of 9 safely, walks at least once in almost every game it seems. Kingery seems to be integral in every game even when his line isn’t particularly great. XBH machine, a stolen base, turning DPs. Yes…..I am hopeful he can pick up a tick or two in a few years. If he were in college he would be in his sophomore season. And when you compare him to consensus top three pick this year, Bendan McKay, who is one year older Fanti, they had similar measurables in physical stature and production. McKay coming out of a PA high school in 2014 had a FB that velo at 88/89….now three years later it Is the low 90s…he has also got bigger and stronger along the way. Fanti was also in that range in HS….87/88. So there is a chance Fanti could also raise his velo a few ticks more with added strength. BTW…. I read they are starting DeLorean re-production again this year. What , who is reproducing the Delorean ? Car guy Romus ? Not really a car guy….but best friends son owned a DeLorean many years ago and went for a ride in it…..one of the bumpiest and hard ride in my life. It was not built for comfort. But here is the info………Humble, Texas site …..so far have not seen anything else lately. Congrats to Fanti on a great performance, he’s a soft tossing lefty but he’s jumping up my prospect list as he just continues to get outs and win games. How can he have not one great pitcher and be this good>??? makes no sense. He is averaging a strikeout per inning over his short career in minors. He is facing, right now, hitters who may not get too much higher on the career rung in baseball, so that may be a partial reason. have read, he has deception, whatever that means, since good hitters however, still can pick up the release point. What I would like to know is what do the more advance hitters, AA/AAA and majors, he has faced in the Phillies org in spring training, have to say about his stuff compared to other lefties that they may have seen in the upper levels of the minors or in the majors. I think you can get a better read on what his pitches do at that point. 89-91 this year. He can command his secondary pitches. The most optimistic report I have gotten is up and down starter or lefty reliever. That sounds really down, but we are also talking about a low-A arm, for all the talk of top prospects we miss that having legitimate major league ceilings on the marginal guys is pretty good. Fanti throw back to back no no in high school. He looks like he could add a few PDS. WTF is up with Randolph ? Hurt , suspended , bad attitude , any of the above ? Mystery man of the organization considering he’s a top draft pick. -At 19, Cornelius Randolph is rather young at the High-A level with Clearwater (.230 average in 17 games, had 3 HR and a double in first five games this year, no extra-base hits since then). I know you mentioned that you haven’t seen the Threshers yet, but what have you heard on him thus far in 2017? I’ve heard good things. I think that Cornelius is, for me, it’s April, it’s High-A at a young age. He’s done fine. He’s been engaged. He hit some home runs early. I think he’s probably struck out a little more than I would like, but I think the plate discipline, the strike zone awareness is still there. He’s done fine. I think, you know, he’s going to have a good summer and the first month is almost over. I’ve have no issues at all with what has happened with him down there. Honestly though what would you expect Jordan to say , other than what he did, he is young and has talent , not point in saying well he is this and that or anything negative. He did hit a dinger this afternoon however. The good news is that he’s still drawing walks and is only 19 facing Hi-A pitching. He’ll be 20 next month. He’s also shown a bit of power this year, although not lately. Strikeouts are a problem. Hopefully he turns it around before too long but until then I’m keeping my eyes open for scouting reports that might shed some light on his struggles. I thought his hit tool was better when drafted. That extended time off didn’t do him any favors. This is why HS prospects are so hard to project. However, I am not writing him off by any stretch because he is flashing power. Just needs hot streak.